Put a whole new face on Emojis with Emoji Brush's unique, original designs! If you love texting with Emojis, you'll love adding them to your photos. Express yourself by adding emotions, expressions and familiar icons to photos, with a personal touch. Simply select a photo from your Photo Library, or take a picture with your iPhone, and customize by dabbing or swiping your screen using our wide selection of Emojis. 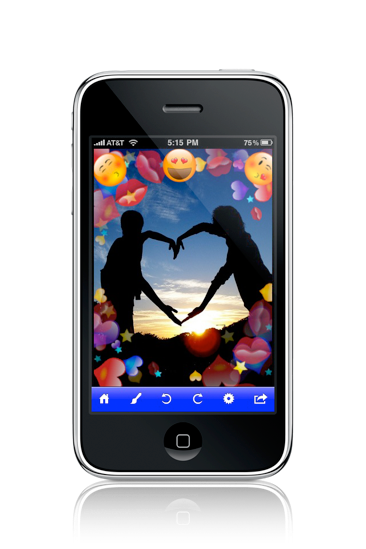 ✴Vary transparency, rotation and size of Emojis to fit any photo. ✴Export resolutions include screen, email or desktop size. ✴Undo/Redo available by swipe or touch. Below are samples of the brushes and characters combinations available through Emoji Brush. - Added 38 new brushes: Snowman, Green Candy Cane, Red Candy Cane, Green Gift, Red Gift, Gingerbread Man, White Ornament, Red Ornament, Green Ornament, Blue Ornament, Tree, Snow Flake, Santa Cap, Stocking, Red Bow, Red Shooting Star, Green Shooting Star, Purple Shooting Star, Penguin, Pink Ribbon, Red Ribbon, Frog, Blob, Leaves, Petal, Action, Speech, Think, Umbrella and Christmas Lights in 9 colors. - We've added a stepped drawing feature for size, transparency and rotation, accessible from the Settings window. Download the free version of Emoji Brush (link below) to see what we have to offer!